HomeNakhon PathomGlide Along the Red Lotus Pond & Try a Lotus Petal Snack! The Red Lotus Pond is a new place to travel in Nakhon Pathom! There is a little market where the locals sell their products. The highlights are boating in the lotus pond and sampling a local Thai snack called "Miang Gleeb Bua" made from lotus petals! Arrive at the Red Lotus Pond in Nakhon Pathom. Enjoy sightseeing, and boating in the Red Lotus Pond! 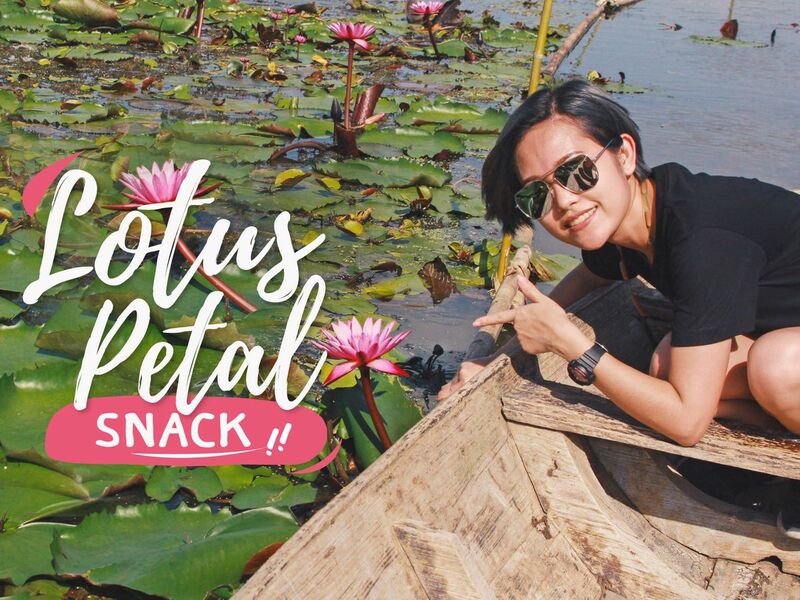 Have lunch of your choice, and try Miang Gleeb Bua (A Thai snack made from lotus petals), and relax at the Red Lotus Cafe at the Red Lotus Floating Market! Let's explore the lives of the locals right here! Right now! End of the trip! Let's head back to Bangkok! Price is including lunch (one dish + one drink/person), local Thai snack "Miang Gleeb Bua", and boating. Price excludes other snacks, drinks, and alcohol. This place is new for Nakhon Pathom area, less tourist visit here. All shops are managed by local people. You can try a real local Thai snack and boating in the lotus pond. Flexible time. I would have given 10 stars for this trip if I could. This trip allows you to visit the non-typical tourist place, the red lotus pond and to "Bpai~Teaw" (travel) in the eyes of a local. Not only is there a boat ride, you get to eat local food and try the special lotus snack. Muk is also a thoughtful and friendly guide. She is very flexible throughout the trip, and shared lots of knowledge with us. When we went to try the lotus snack, she even requested for the waitress to serve the snack on a traditional plate so that we can take beautiful photos for keepsake. Do book this tour if you want a unique, fun and relaxing experience. This is one of those experiences you'll never find on your own. It's different from the typical tourist activities, but it involves many things you definitely should do. The tour includes eating delicious local foods, browsing through a market, going out on a boat in a lotus pond, and trying a very unique lotus petal snack. We loved the whole experience. But even more important, Muk is an amazing guide. She is super attentive, friendly, and eager to ensure a good experience. We were never lacking for cold drinks, foods to taste, and interesting things to see and do. This isn't anything like a commercial tour, Muk takes you to the lotus pond in her car and you probably won't see any other tourists there. Definitely pick this experience if you want to try something a bit different during your visit to Bangkok.